F/i have been at it for over 2 decades now, being one of THE premier space rock bands on the American underground scene. They aren't nearly as prolific as they used to be… their last album, A Question For The Somnambulist, was issued in 2003, and Helioscopium before that, was in 1998. But that's ok because when these guys do decide to make an album it is indeed an event worthy of the wait. 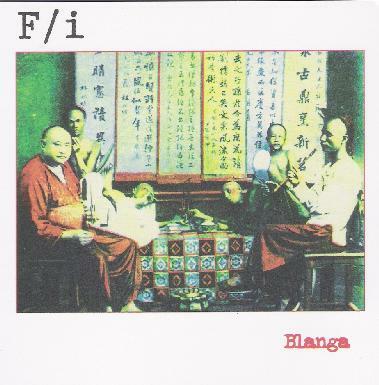 The new F/i album, Blanga, features Richard Franecki on bass and electric sitar, Brian Wensing on guitar, Rick Hake on drums, Grant Richter on electronics, and John Frankovic (Plasticland) guesting on bass and electric sitar, also produced the album. What is Blanga you ask? I dare say most Aural Innovations readers will know the term. But for those who don't, rather than try to explain it I'll just suggest you go out and buy a reissue of Hawkwind's Space Ritual album, put on the headphones, and listen to it at the highest volume you can possibly stand. Do this and the true meaning of Blanga will be revealed. But that's only if you're interested in the historical perspective. Alternatively you could just buy the new F/i CD with its in-yer-face Space Rock attack and absorb the full Blangal experience. The CD opens with the 11 minute "In the Garden of Blanga", a plodding slab of classic F/i and true to heart Space Rock. Slowly bashing guitars, a pounding rhythm section and soaring, tripped out alien synths make for a mind-bending, metallic BLANGA adventure. "Blanga's Transformation" is a mighty space rocking jam that will grab you by the scruff of the neck and toss you around like so much protoplasm. "An Extremely Lovely Girl Dreams of Blanga" is a 5 course banquet of trippy sitars, noisey soundscape surroundings, freakout synths and psycho-metal space jams. Just dig those pounding rhythmic brain drones and raucous driving Spaaaaaace rock. Ya gotta love it. And finally, "Grandfather Blanga and his Band Light it Up" is a monstrously heavy slab of doomy, crushing space rock, with bashing and swirling guitars and classic shooting star synths, stomping over the landscape of your mind like Godzilla wading through downtown Tokyo. What a finale!! All the song titles include the word Blanga. And some, like "The Garden of Blanga in the Morning Dew", are pretty funny, leading me to believe there might be a bit of the old tongue-in-cheek at play here. But there's no denying that this is totally undiluted space rock, the likes of which we don't hear on new releases too often anymore.